Fast Response First Aid Kits Have Arrived! Fast Response first aid kits in Green are here. They can be attached to a belt and contain: a robust bag, trauma fix dressing, shears, wound closure strips, CPR face shield with a valve, gloves, cleansing wipes, adhesive dressing, tape, plasters and OP Airways size 3, 4 and 5 (Airways come in sterile packaging – removed here for clarity). All for £16 plus VAT and postage (£2.80). 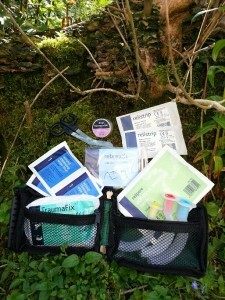 Compact forestry first aid kits are in stock now and will be posted here after the weekend.